Triceratops, Temporary Dinosaur Exhibit, National Museum of Natural History, Washington, D.C. The National Museum of Natural History is a natural history museum administered by the Smithsonian Institution, located on the National Mall in Washington, D.C., United States. With free admission and open doors 364 days a year, it is the most visited natural history museum in the world, and most visited museum (of any type) in North America. Opened in 1910, the museum on the National Mall was one of the first Smithsonian buildings constructed exclusively to hold the national collections and research facilities. The main building has an overall area of 1,320,000 square feet (123,000 m2) with 350,000 square feet (33,000 m2) of exhibition and public space and houses over 1,000 employees. 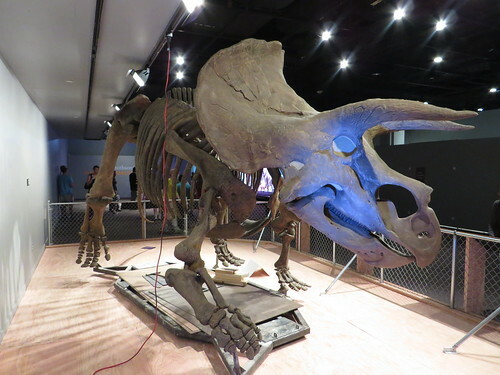 The museum's collections total over 126 million specimens of plants, animals, fossils, minerals, rocks, meteorites, and human cultural artifacts. With 7.4 million visitors in 2009, it is the most visited of all of the Smithsonian museums that year and is also home to about 185 professional natural history scientists — the largest group of scientists dedicated to the study of natural and cultural history in the world.